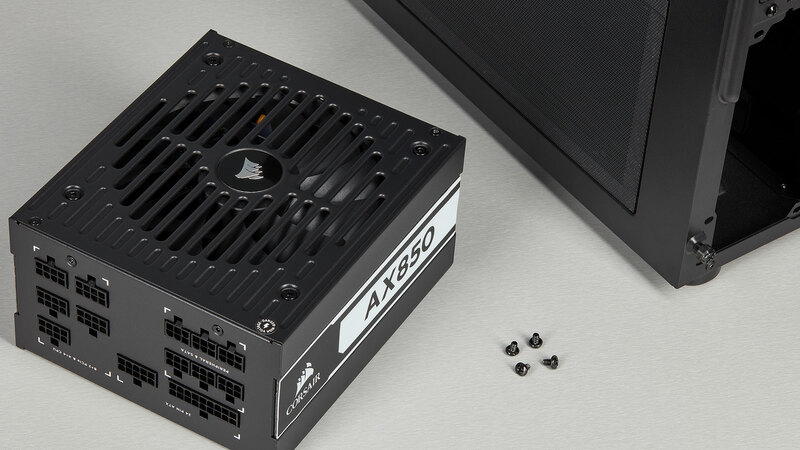 CORSAIR AX Series fully modular power supplies deliver 80 PLUS Titanium efficient power and ultra-low-noise operation to complete your most ambitious builds. The AX850 delivers power at up to 94% efficiency, lowering energy consumption, noise, temperatures, and your power bill. CORSAIR provides a ten-year warranty on all AX Series power supplies; your guarantee of reliable operation that will last across several system builds. If you need help, CORSAIR customer service and tech support are always on hand. Many Corsair PSUs feature a “Zero RPM” fan mode. At low loads, the PSU runs cool enough as to not require active cooling. So, in an effort to significantly reduce PSU noise, the fan controller is programmed not to spin the fan. At higher loads and higher temperatures, the fan will start at it’s lowest RPM and gradually ramp up to faster speeds as needed. In a LINK enabled PSU (RMi, HXi and AXi, for example), one can turn this Zero RPM mode off using the LINK software. If you want to make sure your Corsair PSU with Zero RPM fan mode has a properly functioning fan, simply watch the fan as you power on the PC. The fan should do one, small “test spin” before coming to a complete stop. So how does a better PSU equate to a better computing experience? Consider this: If your power supply isn't doing a good job of regulating voltage and filtering ripple, what is? The computer power supply essentially converts AC to DC. Older or more basic computer power supplies convert AC to multiple DC voltages (+12V, +5V, +3.3V) at the same time. Newer, more advanced power supplies, convert AC to +12VDC, while smaller DC to DC power supplies within the power supply's housing convert the +12V to lesser used +3.3V and +5V. The latter is more efficient because lesser used voltages are not converted unless they're required and converting DC to DC itself is more efficient than converting AC to DC as it requires fewer and smaller components. After that voltage is converted, it's filtered with inductors and capacitors. On the secondary side of this HX1050, we see a very large inductor and a handful of different sized capacitors. So now we have two critical things to look at when looking at the output of this power supply: How well is the output voltage regulated and does this power output have minimal ripple? I just used two words you hear a lot when people talk about computer power supplies: Regulation and ripple. Computer power supplies use a "switching" technology to convert the AC to DC. And while the rectifier is switching on and off, it's producing DC that pulses in rhythm with whatever frequency the AC input is (60 Hz, for example, is your typical North American AC frequency) regardless of the frequency the rectifier is switching at. This is called noise. First, the voltage goes through an inductor, or a choke. This smooths out the waveform and lowers the frequency of the noise. Then you have your capacitors. Capacitors store electrical charges and can then output an electrical charge without the noise. If the voltage going into a capacitor raises or lowers with the switching frequency, the charge of the capacitor raises or lowers. This change in the capacitor's charge is much slower than the frequency of the switched power that's charging the capacitor. While this is how it filters the noise, this also creates ripple (small peaks and valleys in the DC output voltage). This is when larger capacitors, or capacitors in series, can help, because the slower the change between the lowest and highest voltages, the more stable the output voltage and ripple is reduced. But the engineers designing these power supplies have to be careful. If you use too many capacitors, too large of a capacitor or even too large of an inductor, you reduce your power supply's efficiency. Every part of a circuit that power goes through has some loss of power and the capacitors dissipate that filtered noise as heat, and that heat is lost power! This is a screenshot of an oscilloscope measuring ripple on a power supply that does not do a very good job of filtering. When a power supply does a better job of filtering ripple, it will look like this on an oscilloscope. While computer power supplies output multiple DC voltages (+12V, +3.3V and +5V) these are not all of the voltages a computer requires to run. Take the CPU, for example. CPUs used to operate on voltages derived directly from the power supply. Originally, +5VDC. Eventually, this voltage was reduced to +3.3VDC. In an effort to make CPUs more and more power efficient, voltage continued to drop and voltage regulators on the motherboard were required to take either +3.3VDC or +5VDC from the power supply and reduce these voltages to even lower voltages. Naturally, one would think that converting one voltage to another would be more efficient if the before and after voltages were closer together. But as CPU's became faster, they required more power, but at lower voltages. The CPUs themselves were more efficient, but not the process of converting that power. More power (watts) at lower voltages require more current. Higher current, without increasing wire and trace gauge, increases resistance. Resistance then decreases voltage and creates heat, which is counterproductive to the reason CPU core voltages were being lowered in the first place! The solution was the ATX12V standard. A 4-pin power connector that delivers +12VDC, which was then upgraded to an 8-pin power connector that could deliver even more current, was added to the power supply. With the increase of voltage to the CPU's VRMs (Voltage Regulation Modules), less current is required to deliver power to the motherboard. Of course, with this greater delta in voltages (between the +12VDC and the CPU's core voltage), more robust voltage regulation on the motherboard is required. This motherboard uses heatsinks to passively cool components of the voltage regulation circuit. With the new "Haswell" CPU coming from Intel, we'll start to see voltage regulation on the CPU itself. This will reduce power current on the pins that move power from the motherboard's traces to the CPU core and therefore reduce the pin-count required to deliver that power. This will also allow the CPU to dynamically scale the voltage of the CPU more efficiently than ever before. The voltage regulators in Haswell are certainly no slouch when it comes to efficiently converting voltages, but this still does not completely replace the motherboard's duty of converting, and filtering, the +12V from the power supply to a lower voltage as Haswell has an input voltage of 2.4VDC. The same is true with your graphics cards. GPUs really are just small CPUs. Heck, in some cases with GPUs running as fast as 1GHz, they're more powerful than some CPUs! PCIe power connectors coming off of the power supply deliver +12V to the graphics card where voltage regulators drop the voltage down to what the GPU needs. Two PCIe power connectors deliver +12V to this graphics card's PSU, but the GPU doesn't use +12V. It has to convert it to a lower voltage first. The ATX specification says that the power supply is allowed to output voltage with regulation and ripple within a certain tolerance. The ripple can be as much as 1% and still be within specification. That means you can have as much as ±120mV of ripple on the +12V. Your voltage regulation can be as much as ± 5%. That means you +12VDC can be as high as +12.6V or as low as +11.4V and it is still within ATX specification. Likewise, your motherboard or graphics card's voltage regulator would have a similar tolerance for input voltage. In other words, if you have a VRM that is made to convert +12VSC to +2.4VDC, that VRM should be able to take in voltages as high as +12.6VDC or as low as +11.4VDC and still be effectively able to product +2.4VDC. The VRM has an added tolerance for slew rate. Slew rate is essentially the rate at which voltages change from one to another. If voltage drops from +12VDC to +11.99VDC within a microsecond, your slew rate is 10mV/µs. To help maintain these tolerances, your motherboard, graphics cards and other components also has some inductors and capacitors to filter voltages between the power supply and the VRM. So, if everything is within specification, there's no problem, right? Well, not so much. You see, as these components regulate voltage, and the harder they have to work to do so, they get hot. This heat is not only wasted energy, but also shortens the life of the components. And while voltage regulator's MOSFETs are often passively cooled with heatsinks (at least they are on high-end motherboards), capacitors are not. And if the MOSFETs are not passively cooled or there are fewer of them (which would be a VRM with "less phases"), then they will have to work harder to regulate voltage and run even hotter. Heat isn't good for a computer's components, so any way we can address the problem is a plus. Another problem with proper voltage regulation and filtering is that they take up space on a PCB. Like I said with the power supply: If you want to have less ripple, you need to have a larger or more capacitors. The same is true with voltage regulation circuits on motherboards and graphics cards. And the same is true with the MOSFETs too. You can have more phases for cleaner power, but if the MOSFETs aren't capable of more current, the extra phases will not do you any good. But higher power MOSFETs, more phases, larger and more capacitors all take up space. We don't always have enough space on a motherboard or graphics card to give up as real estate for near-perfect on-board voltage regulation. And then there are the effects of ripple on overclocking. While your VRMs may be able to regulate voltages well, they won't be able to get rid of every bit of ripple and that gets passed right through to your CPU or GPU. Those of you that overclock know that you typically have to increase the CPU or GPUs Vcore voltage. This is because, as the transistors in the processing unit cycle, the regulators can't switch on and off at the higher speed required to keep the transistor energized at the required voltage. Increasing the voltage actually gives the CPU more than it needs, but allows the regulators to give the CPU what it needs more quickly than when it needs it. The unfortunate by-product of this is heat (everything keeps coming back to heat, doesn't it?). If you have any ripple in that Vcore voltage, it's going to prevent the VRMs from delivering exactly whatever voltage is needed when the CPU's transistors are operating at whatever clock speed you're trying to operate them at. The solution for this problem is to operate the CPU with an even higher Vcore voltage than what is actually needed. The downside of this is... wait for it.... higher CPU temperatures. So, to summarize, a better power supply actually gives you longer motherboard and graphics card life, better overclocking and even longer life of your CPU and GPU. It's a win-win situation! To help decide which cables will work with your CORSAIR modular power supply, we’ve assembled the chart below. Lot codes for Corsair products can generally be found in the follow locations. For more specific information, please view the Corsair knowledge base Lot Code article for a particular product series. Headsets: The code is located on the earcup's arm. Speakers: The code is located on the back of the subwoofer. Case: The code is located on the back panel. Cooling: The code is located on the radiator. Flash: The code is located on the unit's packaging, near UPC barcode. SSD: The code is located on the label on top of the SSD. Mice: The code is located on the label taped next to the USB connector. Keyboard: The code is located on the packaging near the UPC barcode. Memory: The code is on the memory module's label. PSU: The code is on the PSU label, next to the serial number. Testing our power supply without the use of your motherboard is generally pretty simple. Below we will show you how to test all our PSU's. Connect both the 20-24 pin (AX Series) and the 4-pin Molex (AX/HX series) connector to the PSU. Make sure to use the cables provided with power supply. Note that on many of our PSUs, these cables are permanently connected. Bend the Paper clip into a u-shape. Use the paper clip to connect it to the 20/24 pin connecter. Usually the wires are color coded (one green wire and mutiplie black wires), but with our AX version they are all black. To bridge the correct pins face the cable the exact same way shown in the picture below. Locate the pin which is indicated in Green (your green wire) and yellow (your black wire) on the picture below and bridge the two using the paperclip. One way to help make sure you have the correct pins, locate the missing pin on the 20/24 connector (boxed in blue) as it should be on the same row with the bridged pins (all our PSU series have a missing pin). Make sure the switch on the back of the PSU is set to ( O ) before plugging each side of the power cable to the power supply and the wall outlet. Once the power cord is plugged into both the wall and power supply, make sure to check if all connections are good. Once complete, turn the switch on the back of the power supply to ( I ) and see if the case fan spins. If so, the PSU is functional!